Cassie Peterson trudges through wind-driven snow during a winter storm in Portland, March 13, 2018. A winter storm bringing snow and a wintry mix into Maine Sunday will buffet the state will high winds overnight raising the chances for scattered power outages. The National Weather Service has placed the western mountains and northern Maine under a winter storm warning. A winter weather advisory is in effect for southern Penobscot, interior Hancock and central Washington counties. Meanwhile, a high wind watch is in effect for southern Maine and the midcoast. 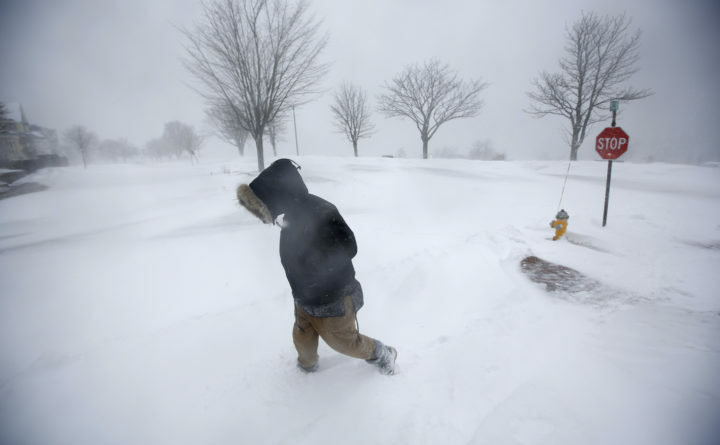 Sunday’s storm will bring heavy snow again to northern Maine, where up to a foot of snow is forecast to fall from Presque Isle to Madawaska, according to the weather service station in Caribou. Up to 8 inches of snow could accumulate across the central highlands from Greenville to Millinocket and over southern Aroostook County, according to the weather service. In central Penobscot County, as much as 7 inches of snow may accumulate. Snowfall will be lighter over southern Penobscot County and Down East, where the weather service forecasts 3 to 5 inches at most and lighter accumulation closer to the coast. That snow in southern Penobscot, Hancock and Washington counties will be accompanied by strong winds gusting up to 35 mph, according to the weather service’s advisory for the region. Along the Down East coast, the weather service is warning of sustained wind speeds of 25 to 35 mph and gusts up to 45 mph Sunday evening into Monday morning. Meanwhile, snow accumulation is expected to be lighter in the southern part of the state, where 2 to 3 inches are expected to fall from Portland up the midcoast to Belfast, according to the weather service station in Gray. Snowfall will pick up inland toward Rangeley and Jackman, where 4 to 6 inches snow may accumulate, and Skowhegan, where 6 to 8 inches of snow is expected. In southern parts of the state, snow could give way to rain or a wintry mix, according to CBS affiliate WGME. As the snow moves out overnight, high winds will stick around for much of the state. Greater Bangor can expect winds to blow 14 to 20 mph Monday morning, with gusts up to 34 mph, according to the weather service. The winds will blow hardest down south, where wind speeds will range 20 to 30 mph and with gusts up to 60 mph, according to the weather service.